Based on Persian and Indian inscriptions, the temple was used as a Hindu, Sikh, and Zoroastrian place of worship. "Atash" (آتش) is the Persian word for fire. The pentagonal complex, which has a courtyard surrounded by cells for monks and a tetrapillar-altar in the middle, was built during the 17th and 18th centuries. It was abandoned in the late 19th century, probably due to the dwindling of the Indian population in the area. The natural eternal flame went out in 1969, after nearly a century of exploitation of petroleum and gas in the area, but is now lit by gas piped from the nearby city. 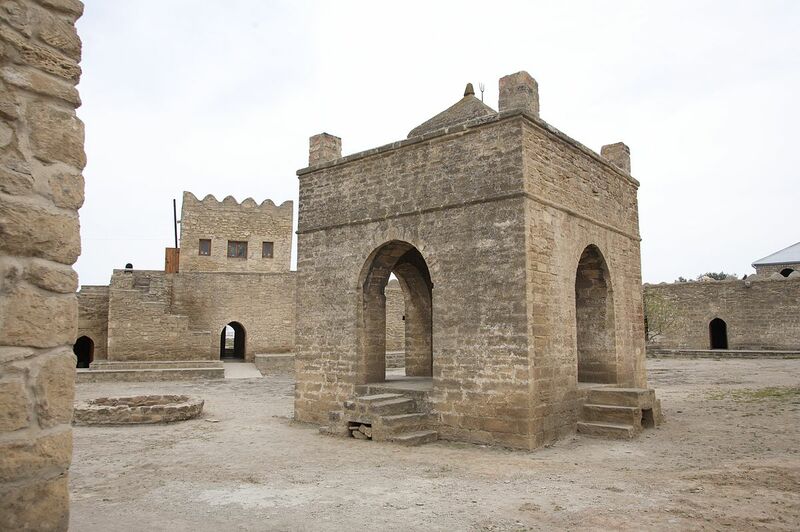 The Baku Ateshgah was a pilgrimage and philosophical centre of Zoroastrians from Northwestern Indian Subcontinent, who were involved in trade with the Caspian area via the famous "Grand Trunk Road". The four holy elements of their belief were: ateshi (fire), badi (air), abi (water), and heki (earth). The temple ceased to be a place of worship after 1883 with the installation of petroleum plants (industry) at Surakhany. The complex was turned into a museum in 1975. The annual number of visitors to the museum is 15,000. The Temple of Fire "Ateshgah" was nominated for List of World Heritage Sites, UNESCO in 1998 by Gulnara Mehmandarova. On December 19, 2007, it was declared a state historical-architectural reserve by decree of the President of Azerbaijan.